How will you keep up with the latest trends to remain competitive in the ever changing digital media landscape? 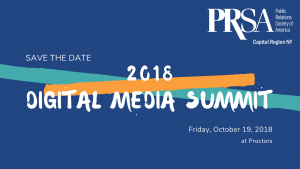 Join as the Digital Media Summit to hear from local experts. Register by Friday, October 12 for a special Early Bird rate! $40 PRSA/NYCRAMA/Ad Club members – Save $10 off the regular $50 rate! $60 Nonmembers – Save $5 off the regular $65 rate!